La Belle Assemblée, November 1814. The description of this ensemble uses the term “slip,” which was sometimes used for an under-dress. The over-dress is called a frock, a term used at the time for a back-fastening dress of thin material. 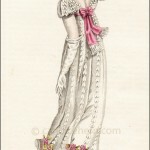 “French rose-coloured silk slip, made tight to the shape and very short in the waist. 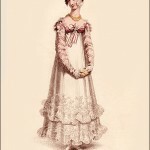 French gauze frock, open behind, the bosom embroidered to correspond with the slip, and the bottom fancifully decorated with artificial wreathes of roses fancifully placed. 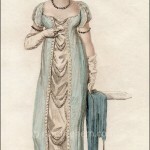 A very short sleeve of French gauze drawn in full compartments, each of which are ornamented with pearl; a double row of pearl goes across the sleeve about an inch from the end. Hair dressed full on the temples and low on each side in front, hind hair à-la-Grecque. head-dress roses fancifully disposed to the side. White satin sandals and kid gloves. Necklace, earrings, and bracelets of pearl. 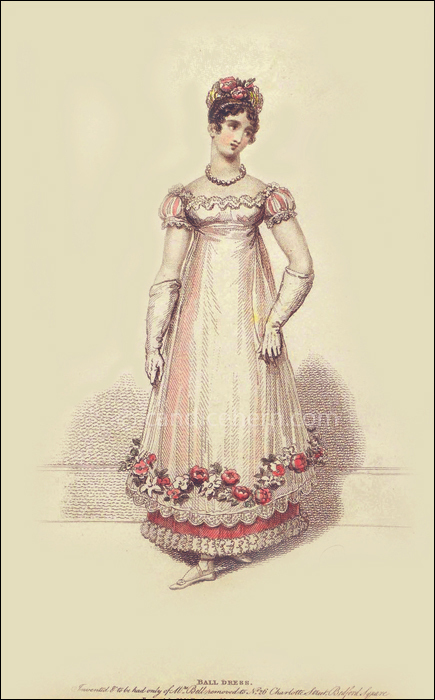 This dress is also much and deservedly admired in white lace; we understand, indeed, that either in gauze or white lace it is universally adopted in the highest circles of fashion; but though we are ourselves amongst its admirers, yet we must own that the simplicity of its form induces us the think that Mrs. Bell has introduced it on purpose to display the superior elegance of her Circassian corsets: if this was the case the object has been most fully answered, and the natural beauties of the shape displayed in the most easy and graceful manner. It is certain that however eminent the British fair always were for elegance of proportion and symmetry of shape, these beauties were never seen to so much advantage as since the introduction of the Circassian corset.